Today, I am going to take a look at the ill-conceived musical comedy flick, Rhinestone. The screenplay for Rhinestone was co-written by star Sylvester Stallone (Rocky, First Blood) and Phil Alden Robinson (Sneakers, Field of Dreams). However, Robinson apparently took issue with Stallone’s many changes to his screenplay, and distanced himself from the film as a result. Rhinestone‘s director was Bob Clark, whose list of directorial credits includes such varied films as Black Christmas, Porky’s, A Christmas Story, Baby Geniuses, and Superbabies: Baby Geniuses 2. 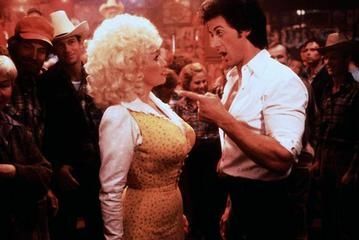 The primary cast of Rhinestone is made up of Sylvester Stallone (Cobra, Tango & Cash, Demolition Man, Over The Top, Judge Dredd, Death Race 2000, Driven), country music star Dolly Parton (Steel Magnolias, The Best Little Whorehouse In Texas), Richard Farnsworth (Misery, The Two Jakes, The Natural), Ron Leibman (Auto Focus, Slaughterhouse-Five, Garden State), and Tim Thomerson (Trancers, Near Dark). Rhinestone had two credited editors: John Wheeler (SpaceCamp, Rocky IV, Ladybugs) and Stan Cole (Prom Night IV, Black Christmas, Baby Geniuses, Superbabies: Baby Geniuses 2). 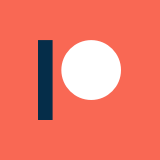 The cinematographer for the film was Timothy Galfas, who is best known for his work on Ralph Bakshi’s animated take on The Lord Of The Rings, but has done very little else of note on screen. 25 RIAA certified Gold, Platinum, and Multi-Platinum awards, she has had 25 songs reach No. 1 on the Billboard country music charts, a record for a female artist (tied with Reba McEntire). She has 41 career top 10 country albums, a record for any artist, and she has 110 career charted singles over the past 40 years. All-inclusive sales of singles, albums, hits collections, and digital downloads during her career have topped 100 million worldwide. She has garnered nine Grammy Awards, two Academy Award nominations, ten Country Music Association Awards, seven Academy of Country Music Awards, three American Music Awards, and is one of only seven female artists to win the Country Music Association’s Entertainer of the Year Award. Parton has received 47 Grammy nominations. Dolly Parton’s soundtrack for the movie produced two Top 10 country music hits: “Tennessee Homesick Blues” and “God Won’t Get You”. Rhinestone is a unique twist on George Bernard Shaw’s Pygmalion, a 1913 play in which a phonetics professor bets that he can train a low-born cockney woman to pass as a duchess at an official function. The story has been portrayed on both the stage and screen countless times since its debut, but Rhinestone‘s Americanization and country music twist on the tale make it stand out from the other more direct adaptations out there, like 1964’s My Fair Lady. Rhinestone wound up with nine Golden Raspberry Award nominations, which are given out annually to the worst movies and performances of the year. Stallone managed to take home the distinction of Worst Actor, and “Drinkenstein” took Worst Original Song. The film was additionally nominated for such awards as Worst Picture, Worst Screenplay, and Worst Director. Rhinestone was made on a production budget of $28 million, on which it took in a lifetime theatrical box office gross of $21.5 million, making it a notable financial failure. The reception to Rhinestone, if anything, was worse: it currently holds a dramatically low 3.7/10 IMDb user rating, along with Rotten Tomatoes scores of 15% from critics and 35% from audiences. 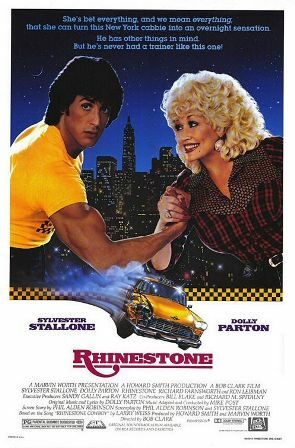 The biggest thing to note about Rhinestone is that everything good about the film boils down to Dolly Parton, and everything bad about it can be traced to Sylvester Stallone. It is like a yin-yang in form of a musical comedy movie. The musical score is absolutely solid, and is almost enough to float the film on its own. Likewise, Parton’s performance is honestly charming and likable, and she makes easy work of her banter. On the flip side, however, Stallone is especially wooden and unlikable in this movie, which is odd, since he rewrote the screenplay himself. Particularly during any key moments of banter, he just can’t make anything work. I think the guy just lacks comedic rhythm, which is absolutely necessary for this kind of role. Throughout the movie, he stumbles his way over words like he is knocking over barstools, and robs the story and comedy of any potential momentum. All of those issues don’t even get into the most notorious issue with this film: the singing. Stallone is debatably a better comedic actor than he is a singer, and that is saying a lot for the man who brought the world Stop Of My Mom Will Shoot. His singing and performing is laughably terrible, which is interesting for a movie like this. Basically, he is supposed to be awful for most of the movie, and he does that task serviceably. However, when the story mandates that his skills improve, he isn’t quite up to that challenge, which challenges the internal logic and reality of the movie. Overall, I think if you look up clips of the key songs in Rhinestone, like “Drinkenstein,” then you have hit the highlights of this movie. Between the songs, it really bogs down thanks to Stallone’s un-entertaining buffoonery and his loose grasp of the English language, and nobody deserves to sit through that. If curiosity has deeply gripped you, or you are just a fan of Parton’s music, then it might be worth digging this flick up. However, don’t expect too much.